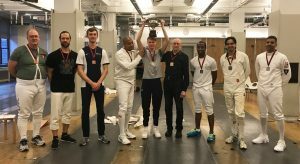 On Sunday, November 12, eight teams of FC Military Veterans, Veteran fencers and elite epee fencers came together to compete in our “Salute Our Soldiers” Team Fencing and Fundraising Challenge (see below for results). Leading up to the event, teams raised more than $20,000 to support our Veterans on Guard Military Fencing Program from 88 individual donations and a $10,000 anonymous matching gift. Thank you to all our supporters! To see the results of the fundraising campaign, please click HERE. 100% of the proceeds went directly to support our Military Veterans. Since 2013, the Fencers Club Veterans on Guard Military Fencing Program has served more than 250 Veterans and Active Duty personnel throughout the NYC Metro area. In partnership with the U.S. Olympic Committee, U.S. Paralympics and the U.S. Dept. of Veterans Affairs, we provide a comprehensive fencing program to Veterans, including training, uniforms and equipment, and competition opportunities–all free of charge.